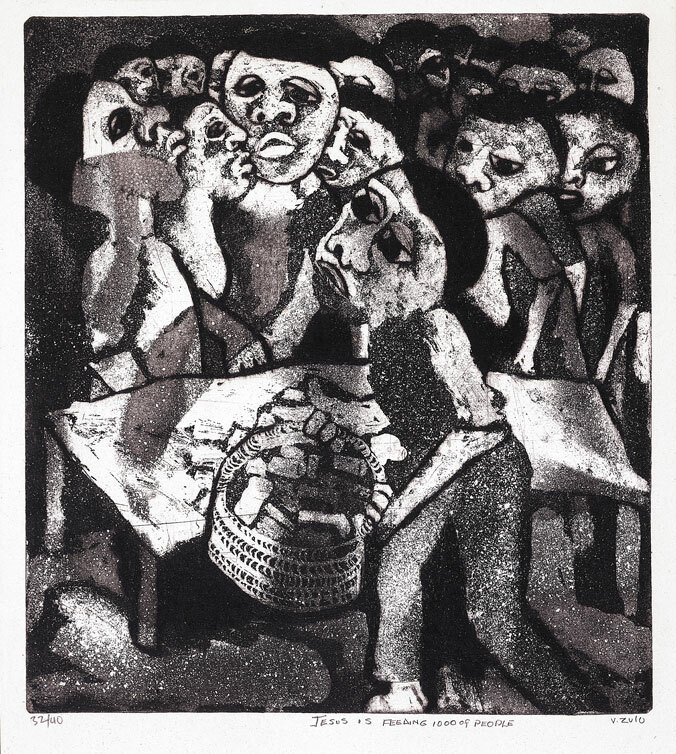 The Art and Craft Centre at Rorke’s Drift began as a Swedish mission self-help centre, teaching skills such as weaving to impoverished rural women living in KwaZulu-Natal, but founder Peder Gowenius opened an art school in 1968, attracting students country-wide. 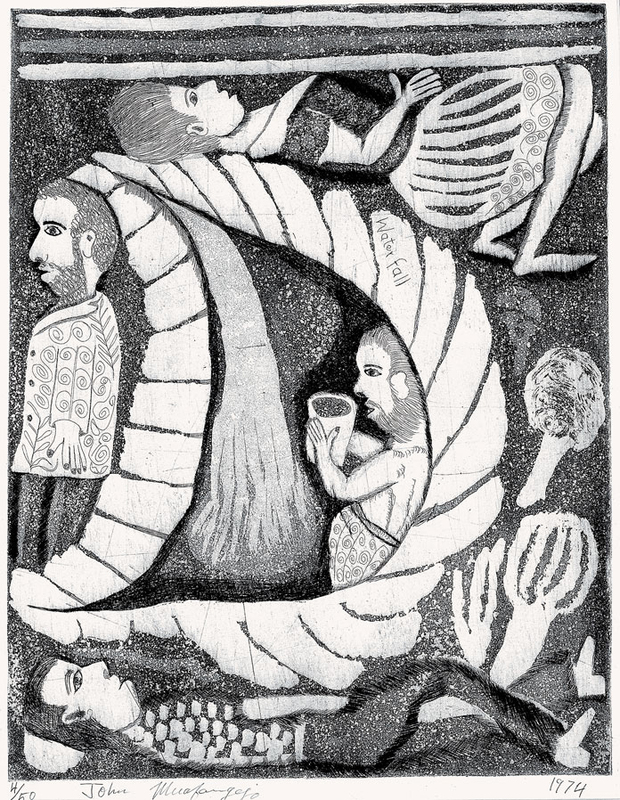 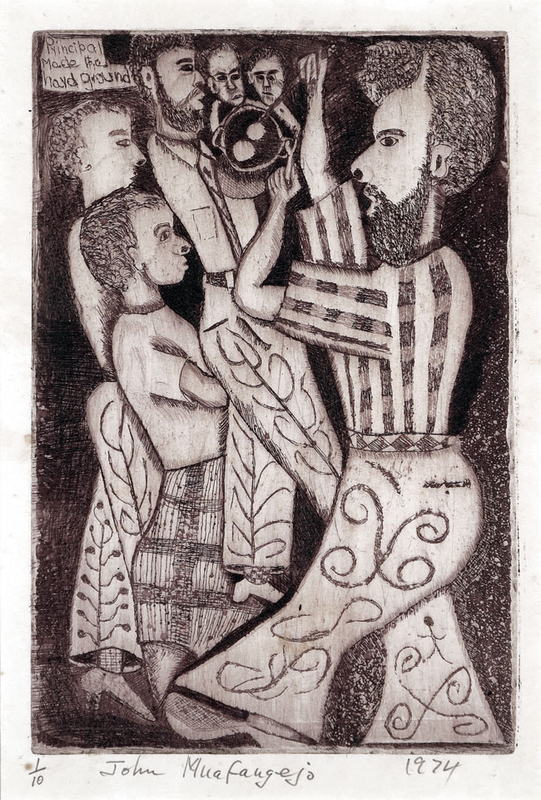 The teachers, many from Europe and the United States, offered a wide range of media, with printmaking favoured because it produced multiples for sale. 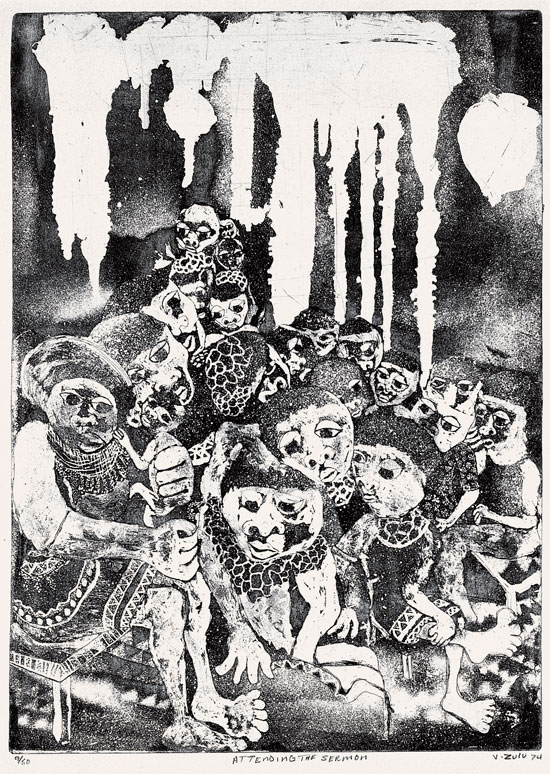 Although best-known for linocuts, which students could continue to make without expensive equipment after returning home, Rorke’s Drift also taught other print processes, particularly etching and aquatint. 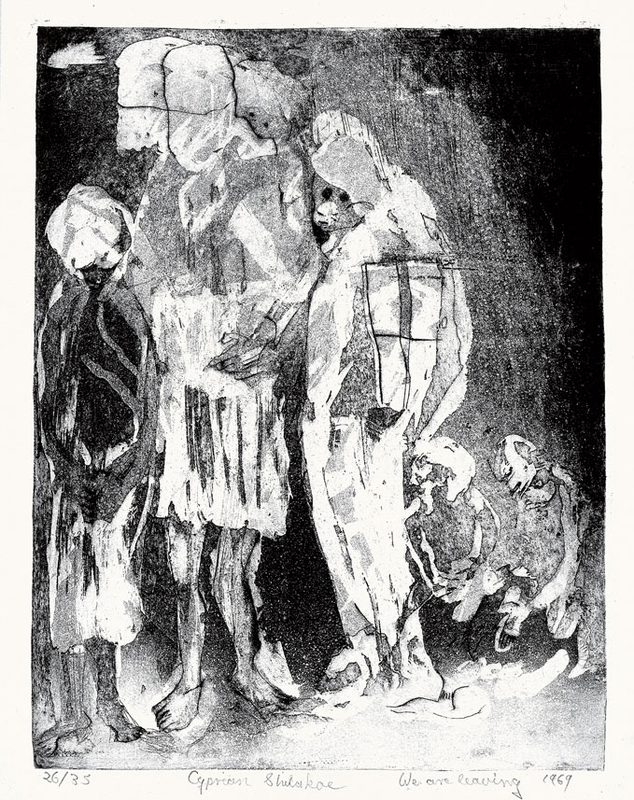 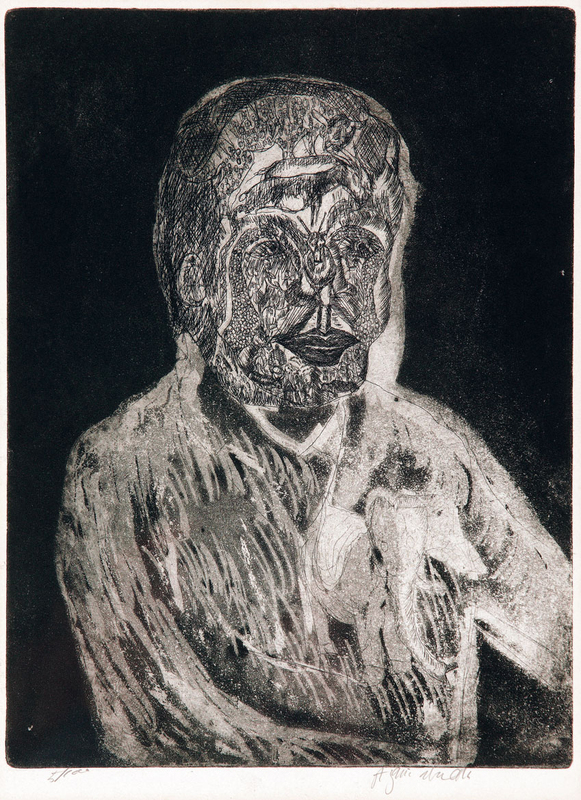 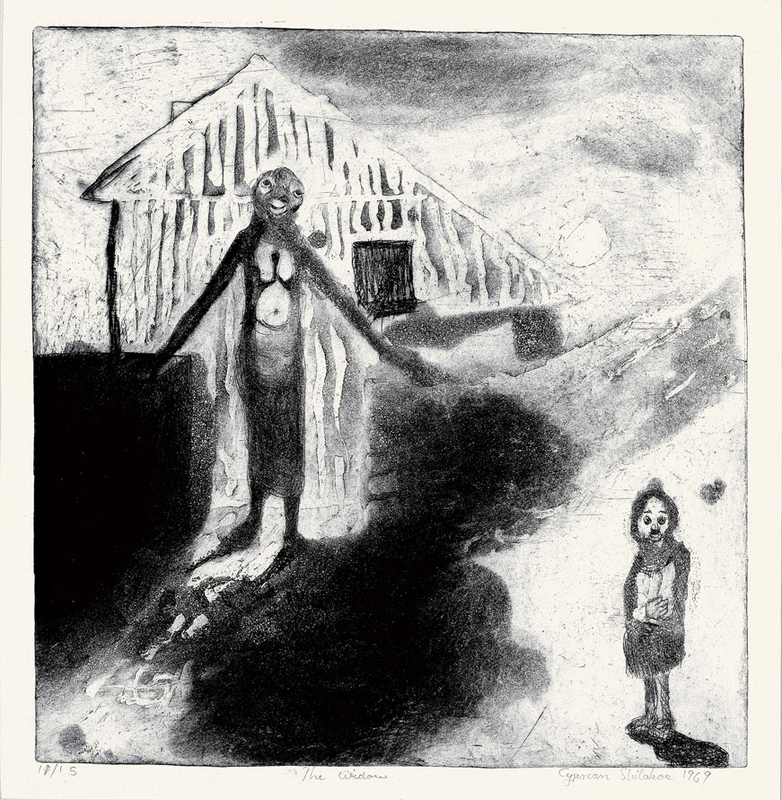 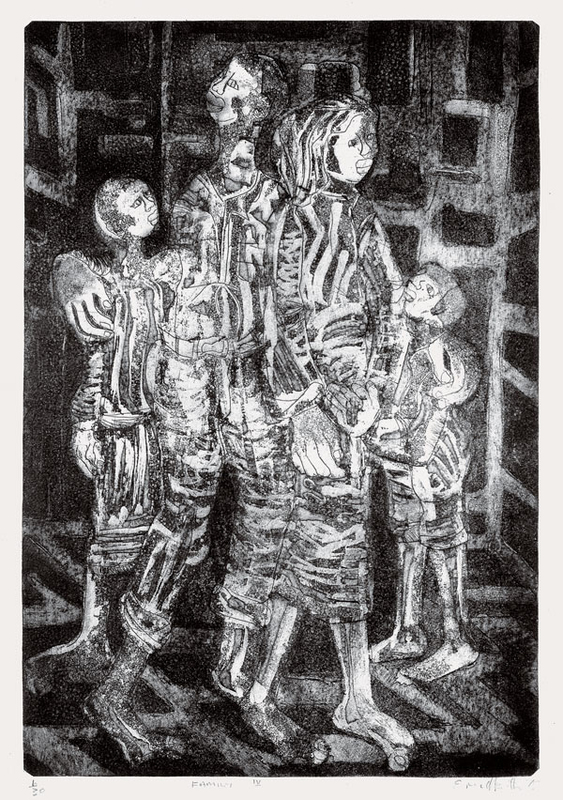 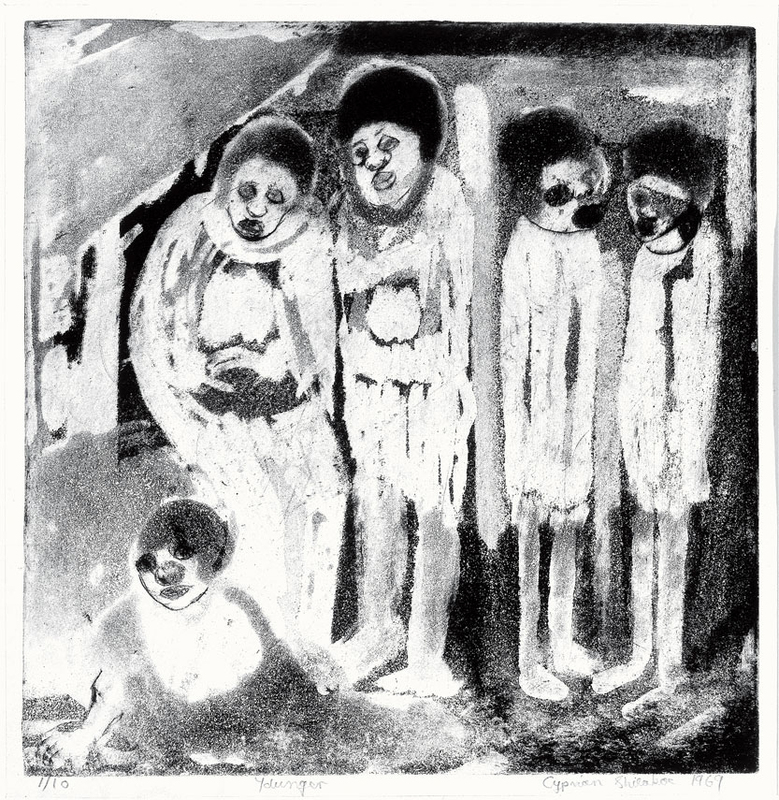 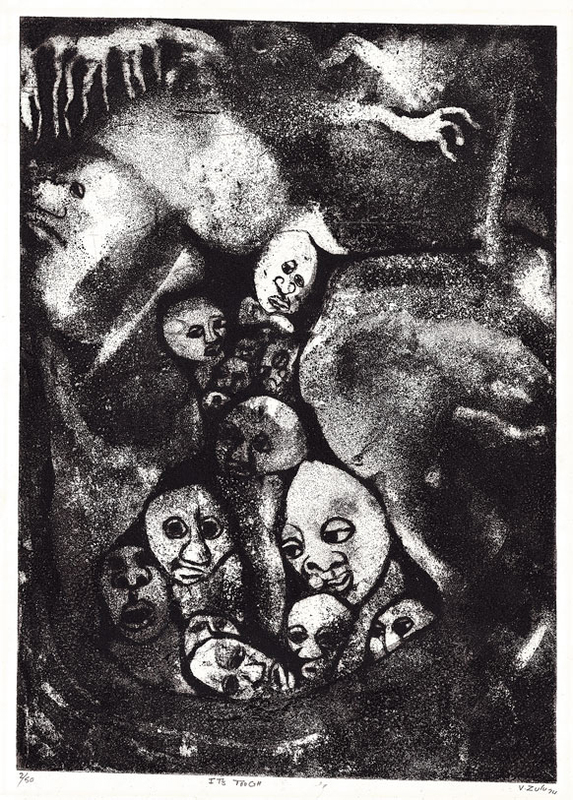 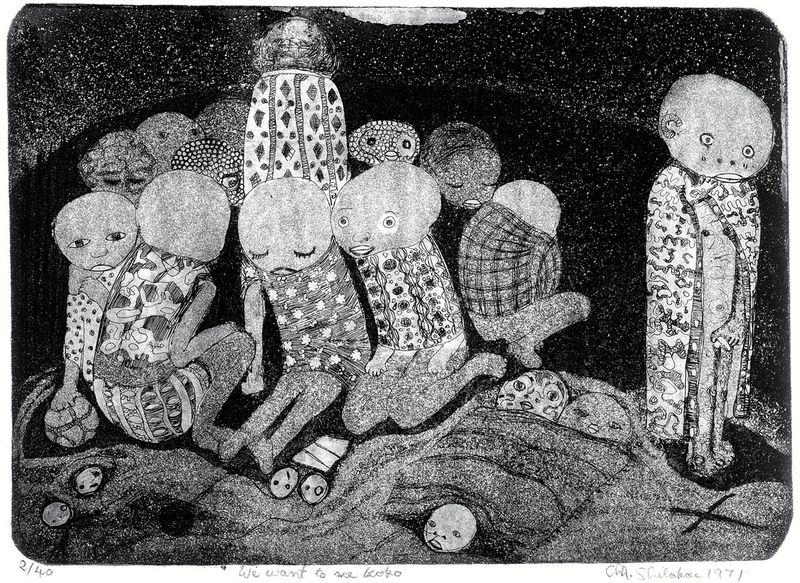 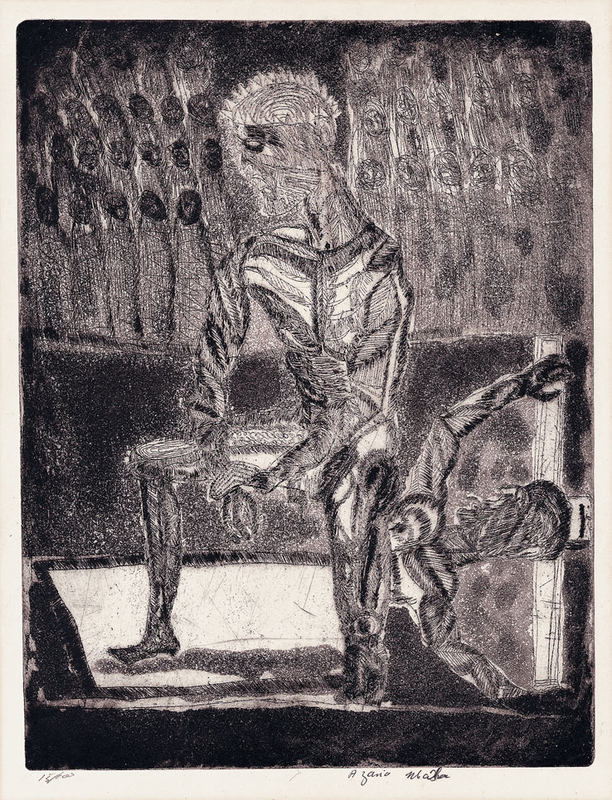 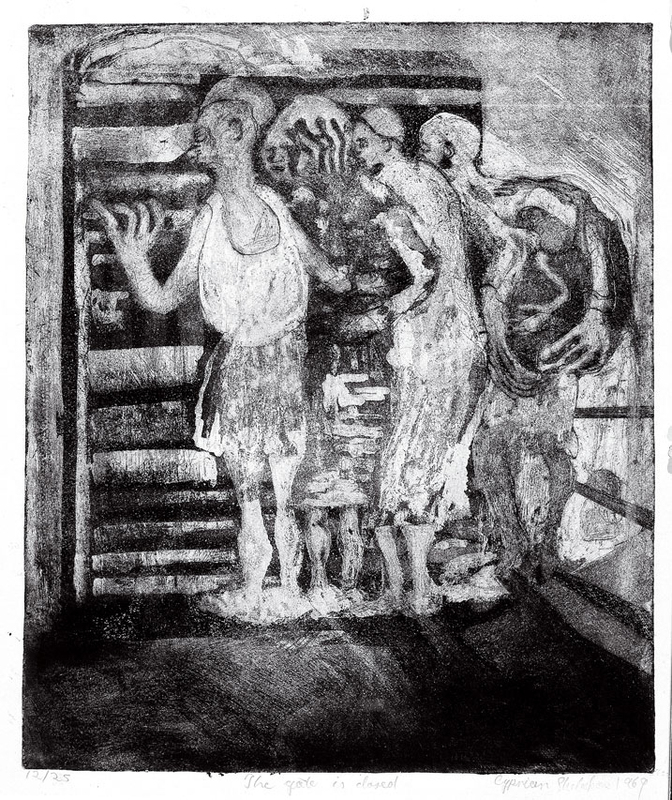 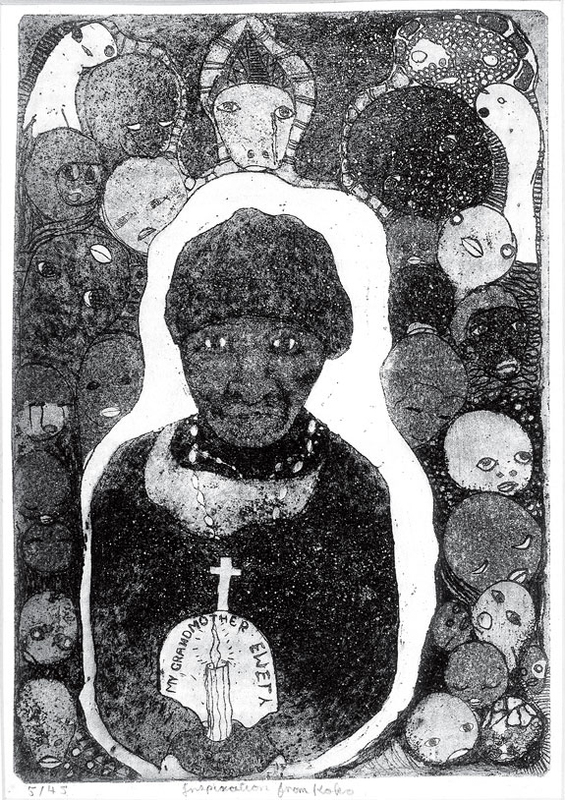 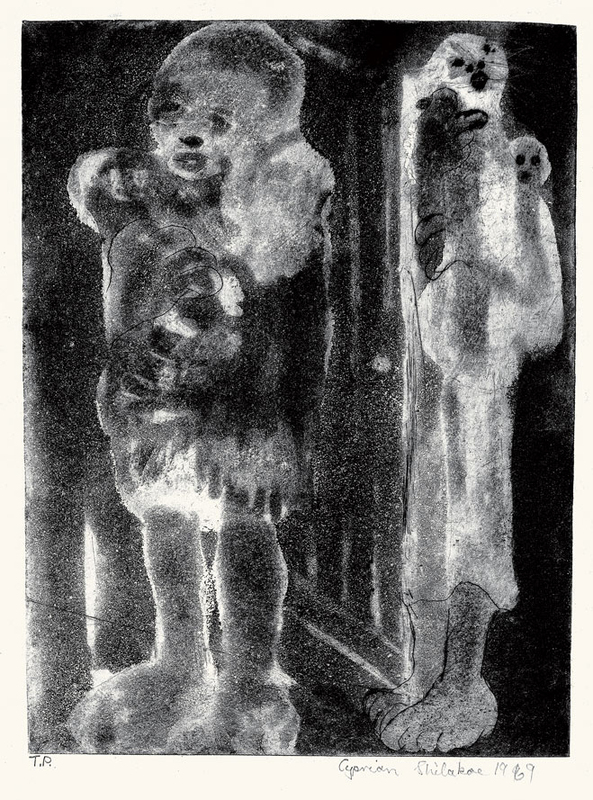 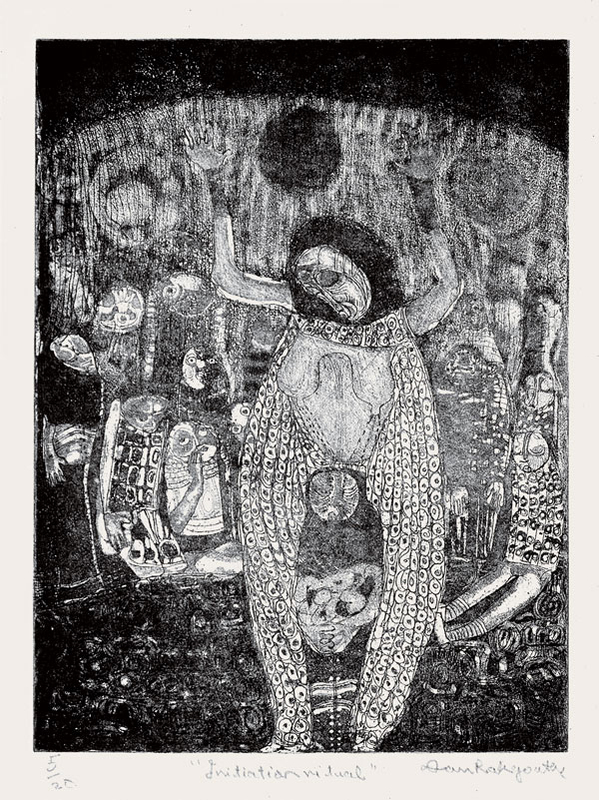 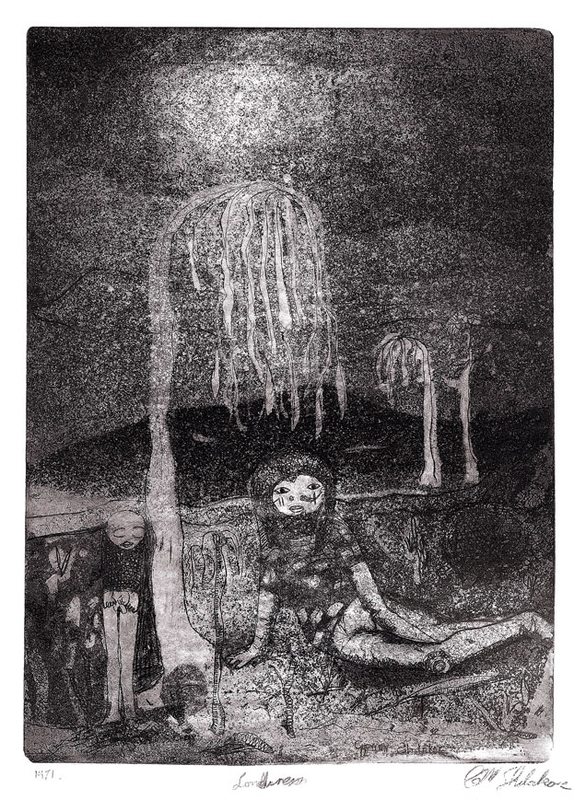 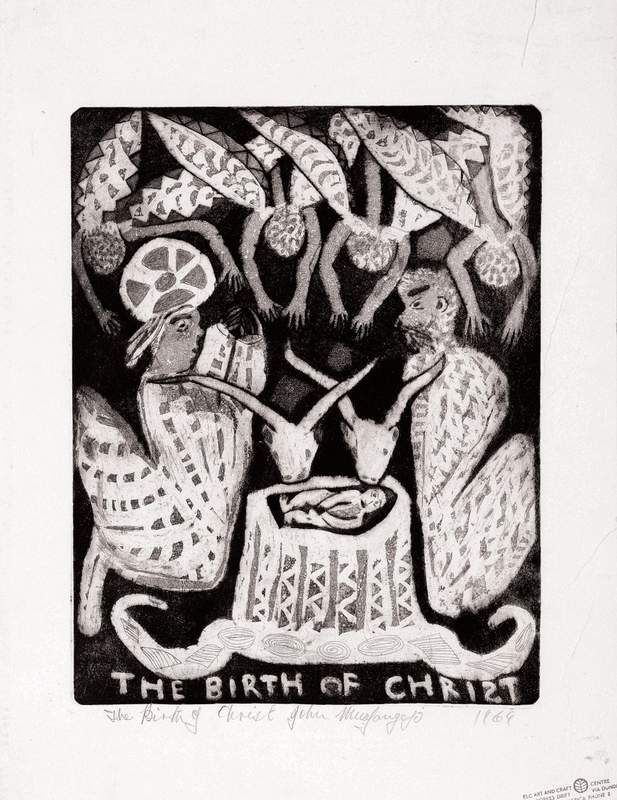 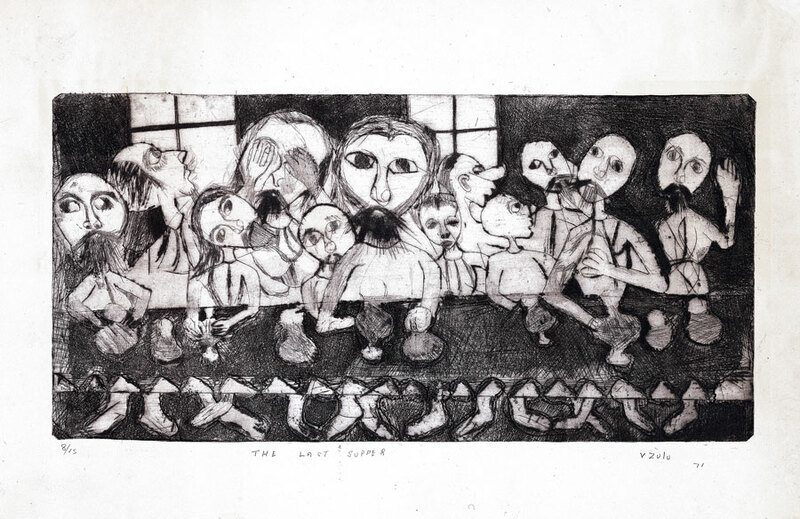 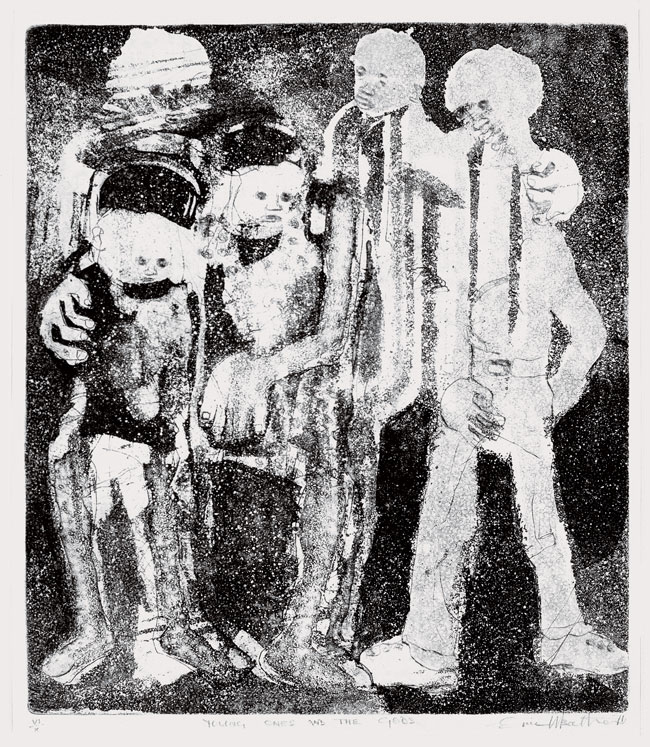 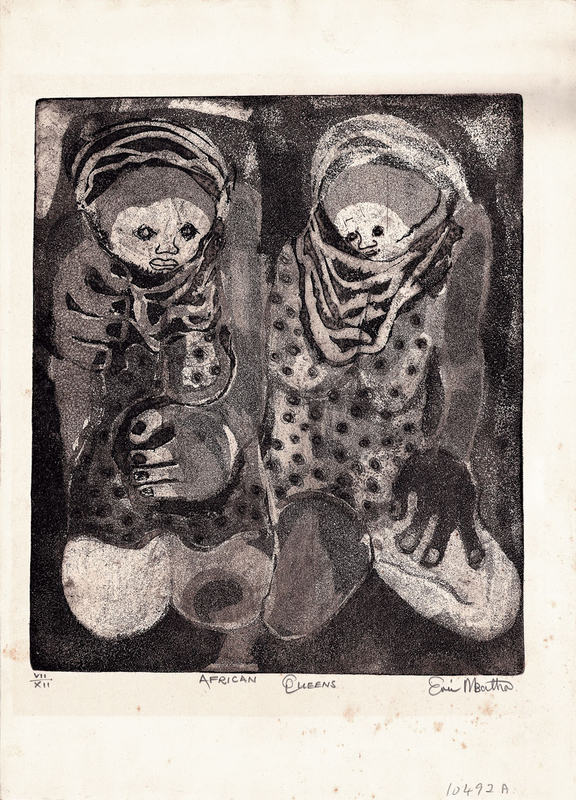 Already having made etchings in Sweden, Azaria Mbatha was probably among the first to use the etching press set up by Ola Granath in 1967 before the school opened. 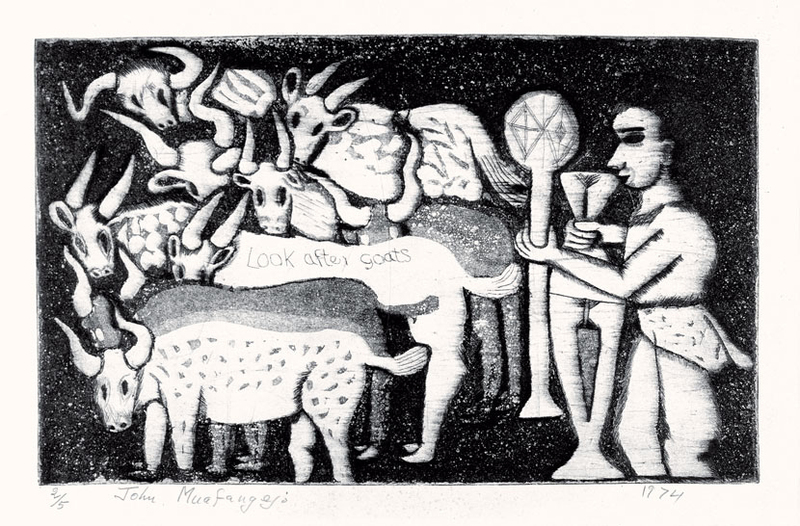 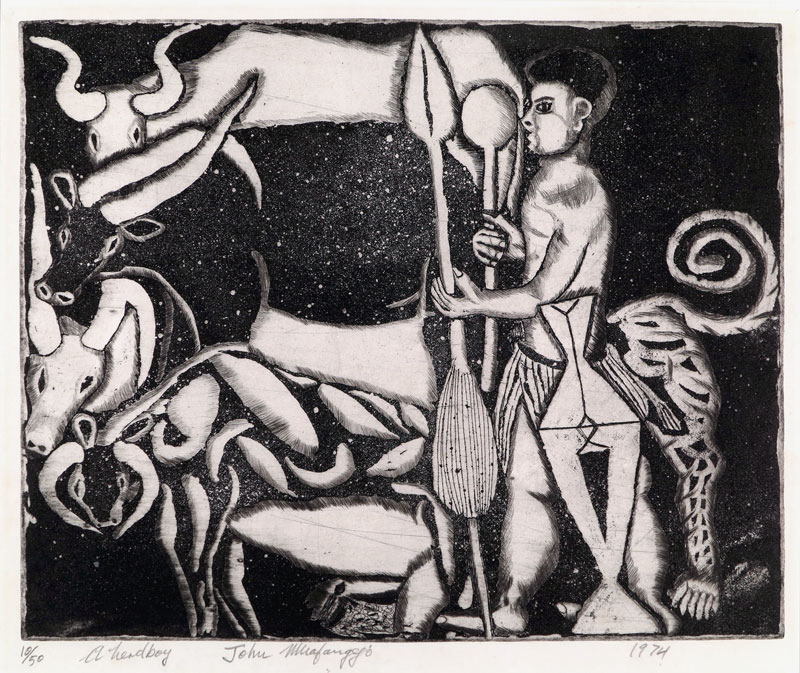 Dan Rakgoathe only rarely took the opportunity to translate his dynamically cut surfaces into this medium, but John Muafangejo kept returning to Rorke’s Drift to re-conceive his distinctive linocut narratives as etchings. 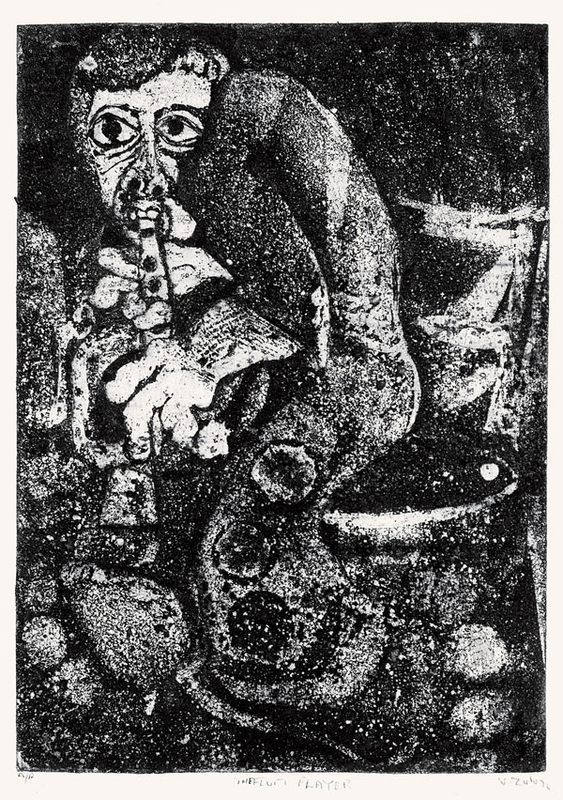 Others succeeded in acquiring presses. 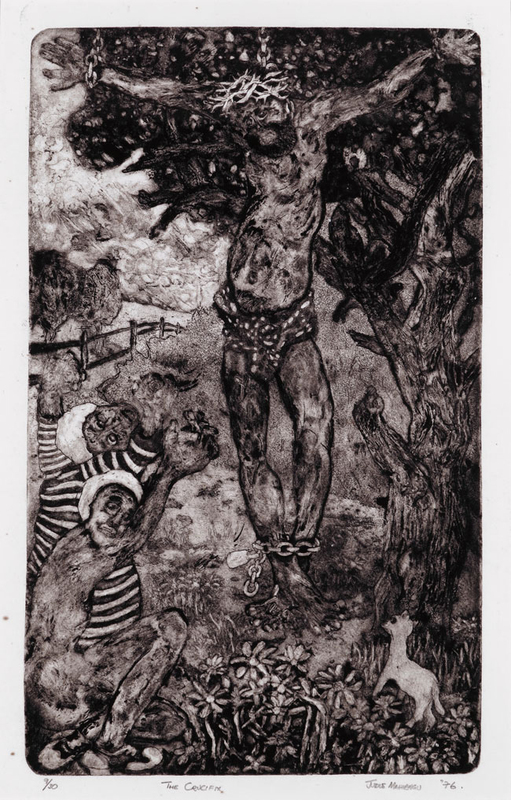 Cyprian Shilakoe obtained one through teacher Otto Lundbohm, and produced etchings throughout his short career, his method of painting acid onto his etching plates creating highly emotive images. 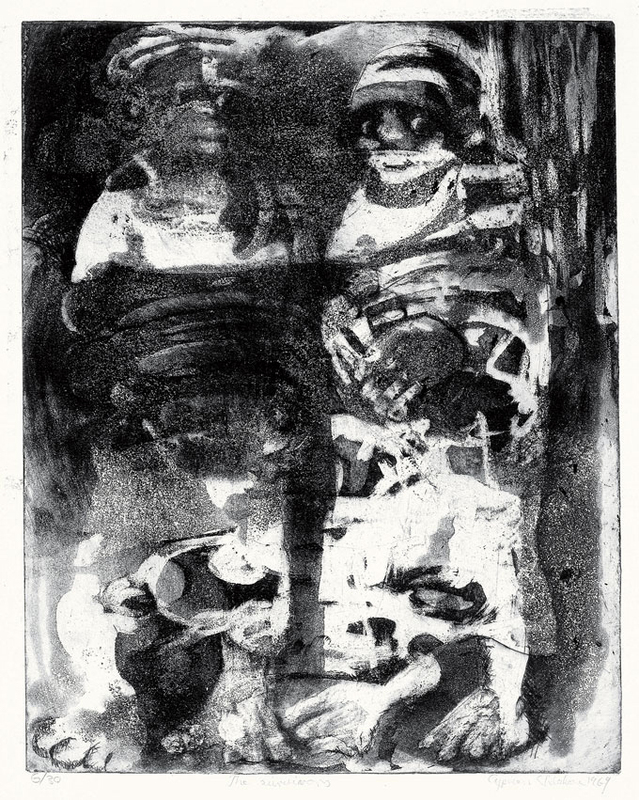 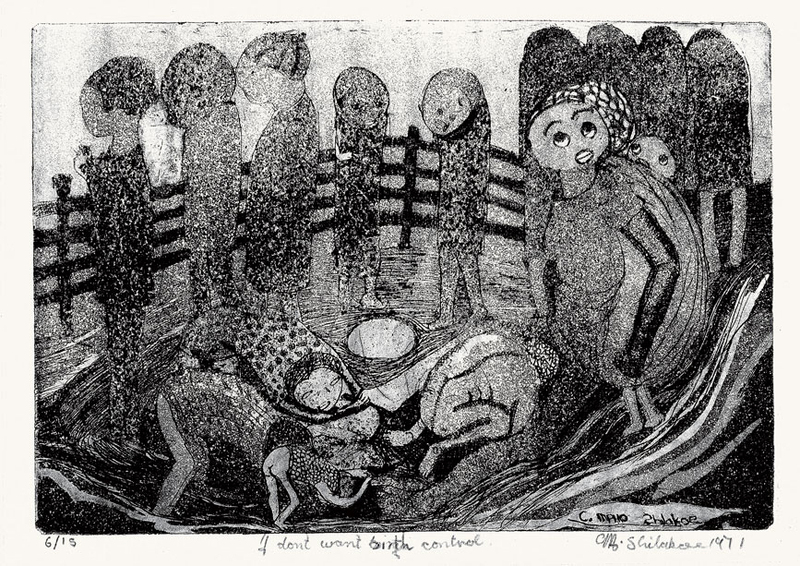 His press was later acquired by Eric Mbatha, who explored a similarly evocative tonal approach, as did Vuminkosi Zulu. 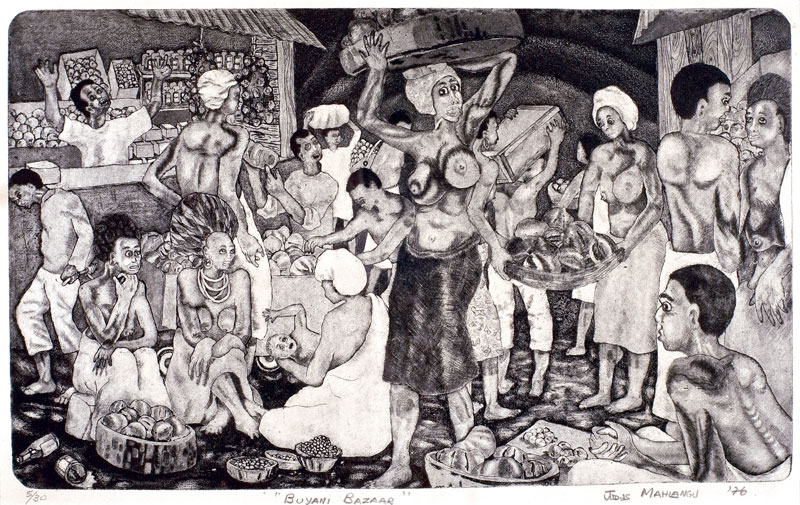 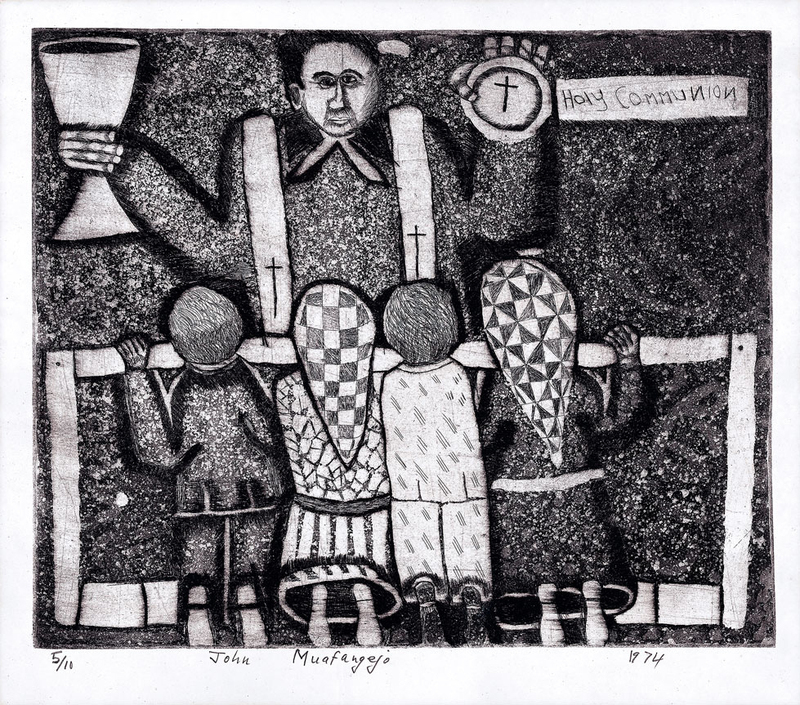 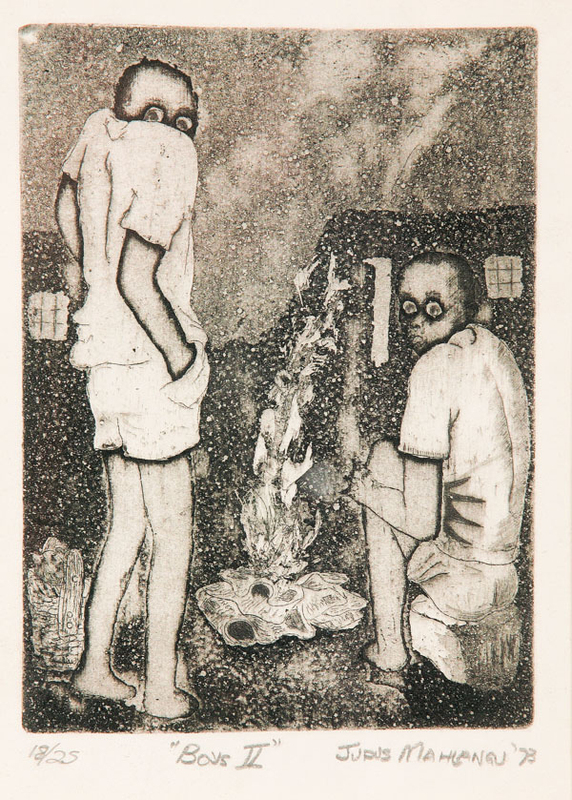 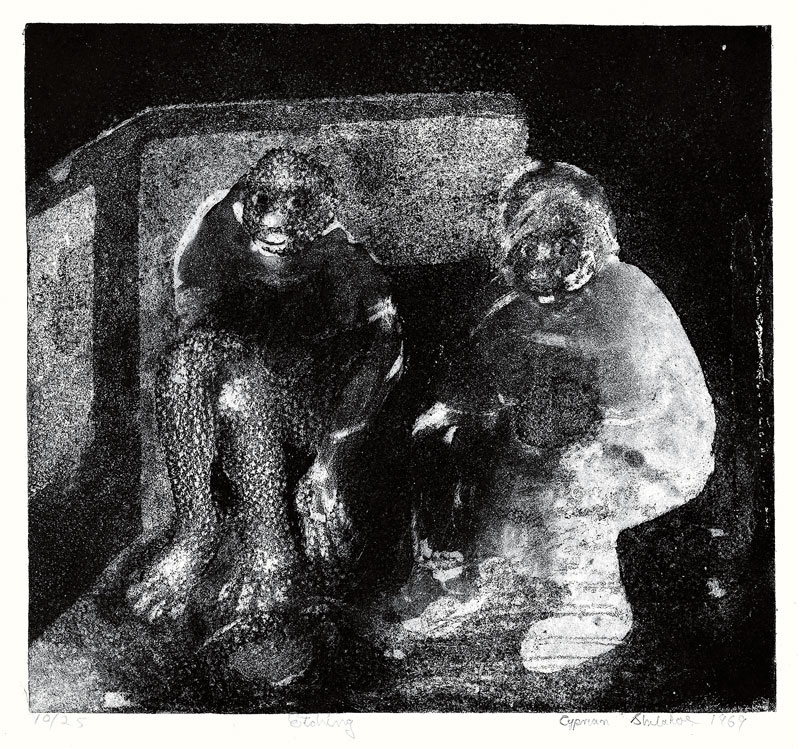 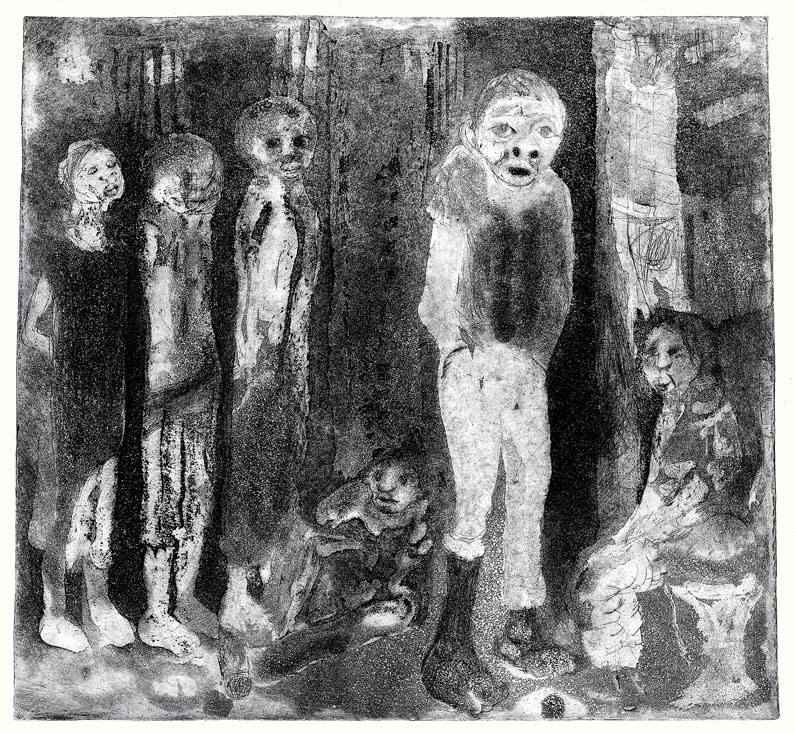 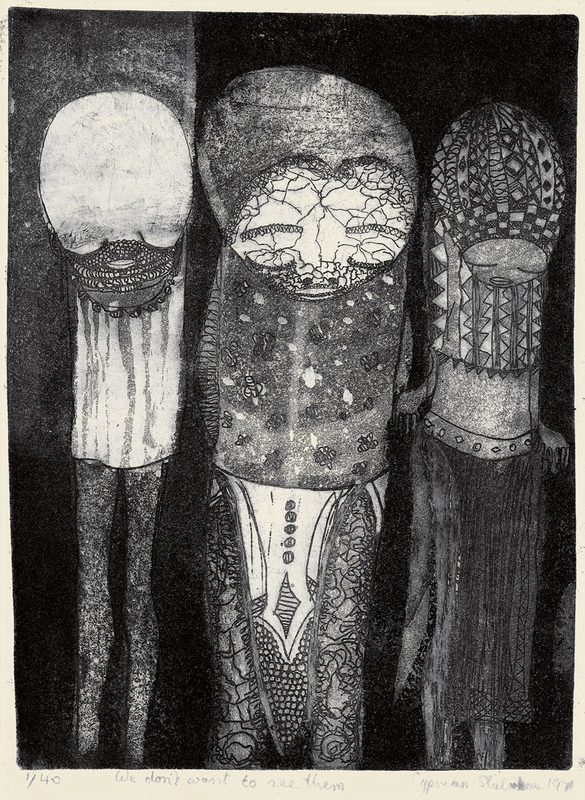 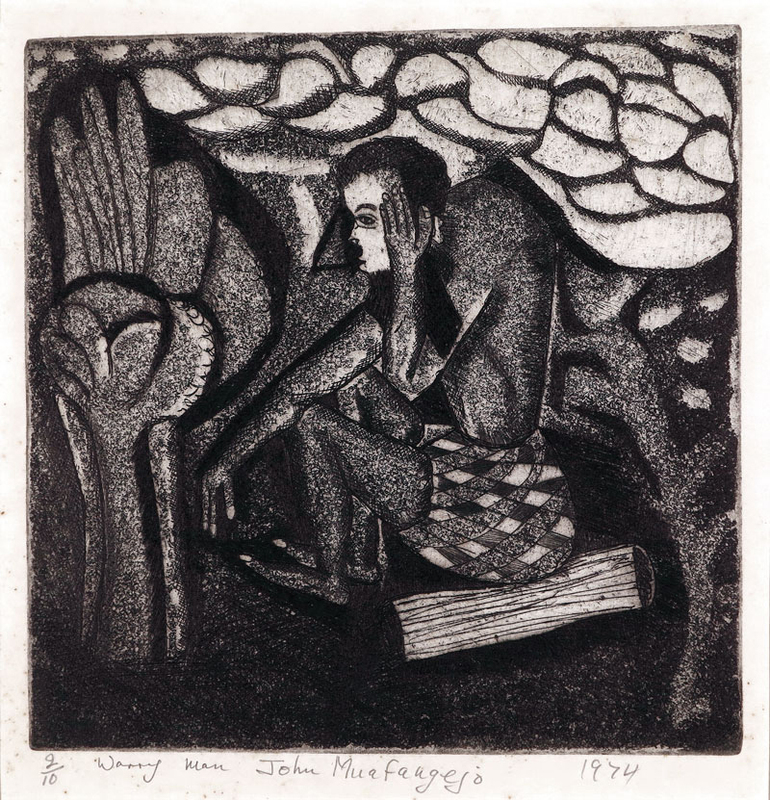 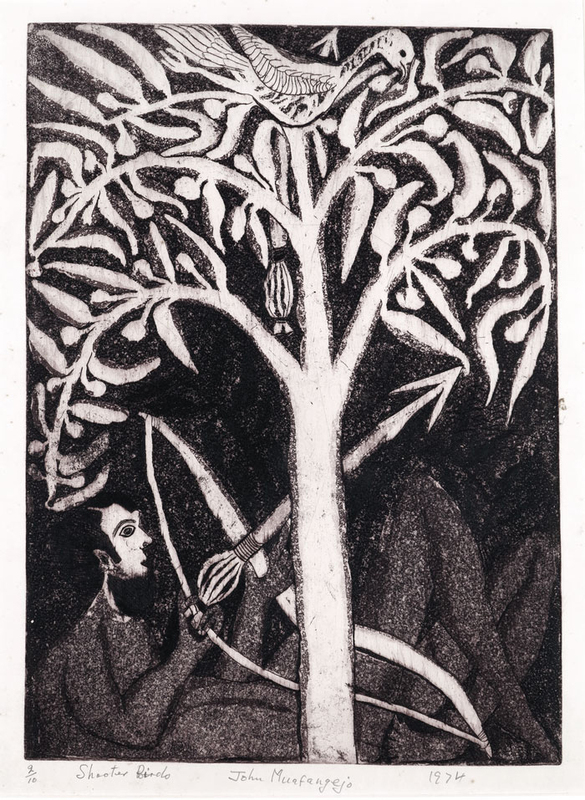 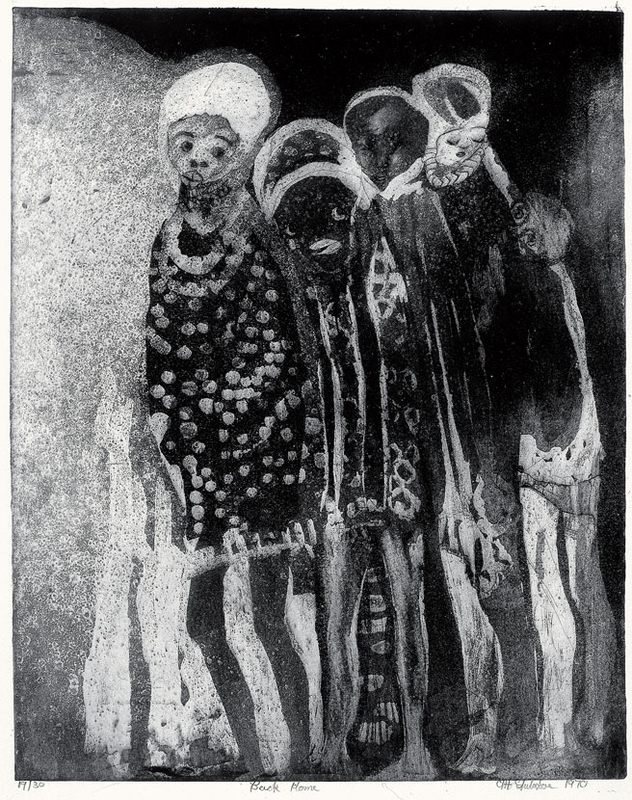 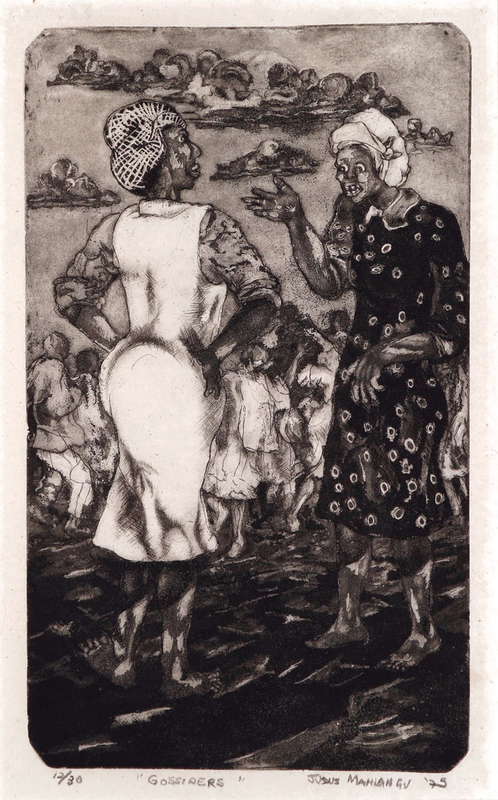 Zulu’s press was sold on to Judus Mahlangu, who developed ‘false mezzotints’ by burnishing back into aquatint surfaces. 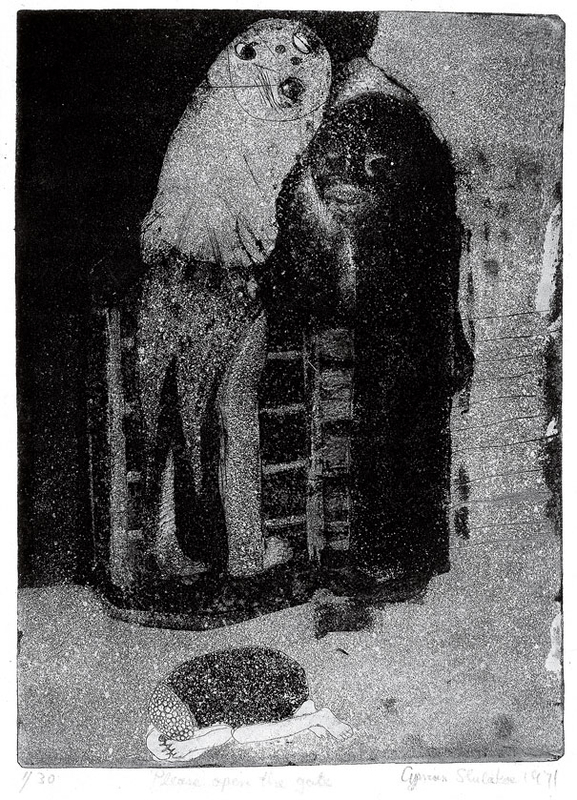 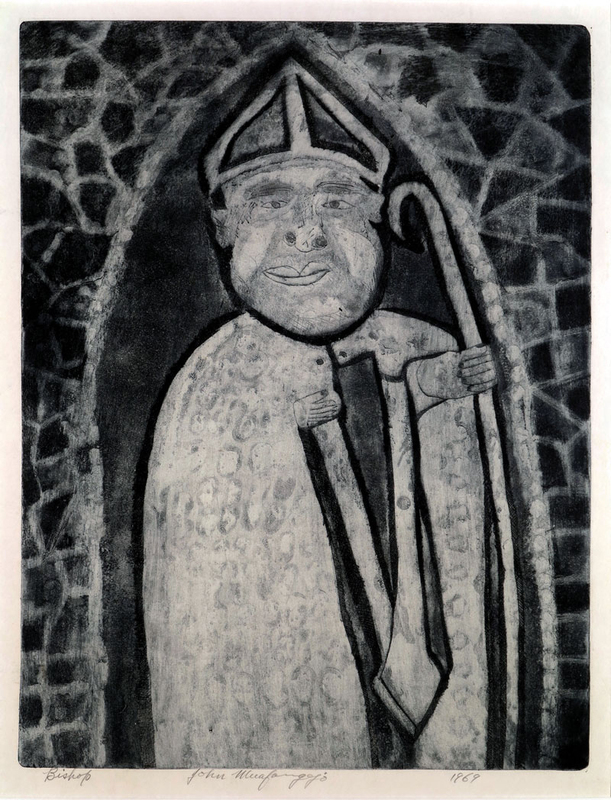 Etching, aquatint on woven paper. 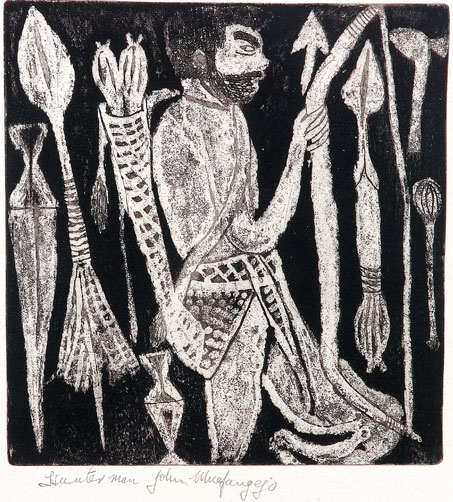 The range of works on this exhibition of little-known etchings abundantly affirms the individuality and innovation of Rorke’s Drift printmakers. 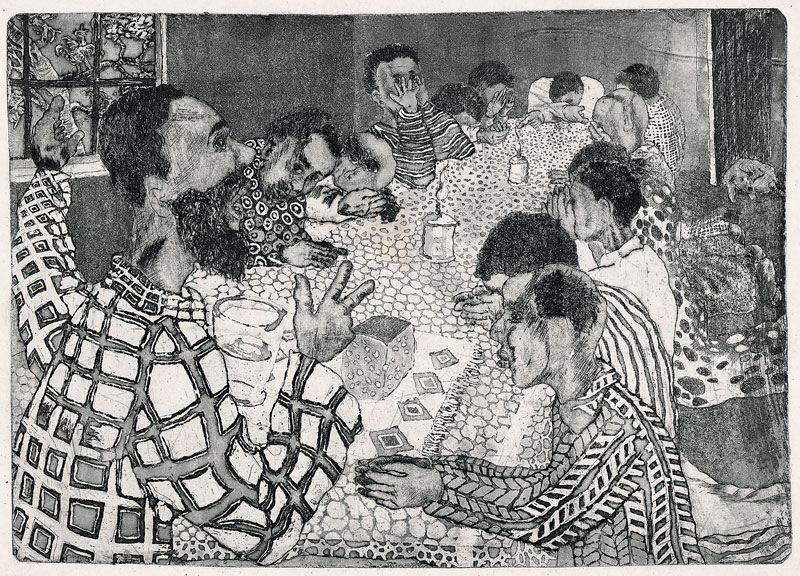 If you are experiencing difficulty viewing this gallery please download the latest version of Adobe Flash Player for your browser by clicking here.